Get 30% off a $25 certificate toward having your oriental or area rugs cleaned. No Cash value. No credit for unused portion of certificate. Can not be combined with any other offer or promotion. 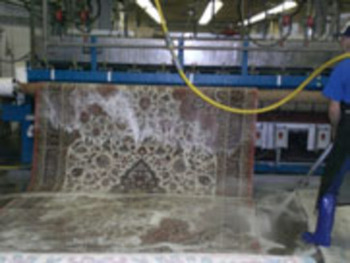 Superior Rug Cleaning uses the finest process, and is the oldest rug cleaning company in America. All rugs are tagged with security bar coded tags, then inspected for color, type, size, condition and appropriate cleaning and special handling needs. Rugs are then dusted to remove sand and loose grit from between the pile. Accumulated fine sand destroys the fibers and increases wear dramatically. Rugs are hand pre-washed for stains and heavy soil. Our 16-foot-wide flatbed washing machine gently jet-washes your rug with warm water and a special detergent. Immediately following the wash, your rug is rinsed in cold water and wrung out. The rug is then hung on automated poles that hoist the rug into our temperature- and humidity-controlled dry room. Following the drying of your rug, it is once again inspected. If it does not meet our stringent cleaning standard, it is returned to be re-cleaned. Otherwise, fringes are hand-cleaned and re-dried.